A song-and-dance team (Bing Crosby and Fred Astaire) in love with the same woman (Virginia Dale) part ways when Crosby decides he wants to open a rural inn featuring performances only on holidays. 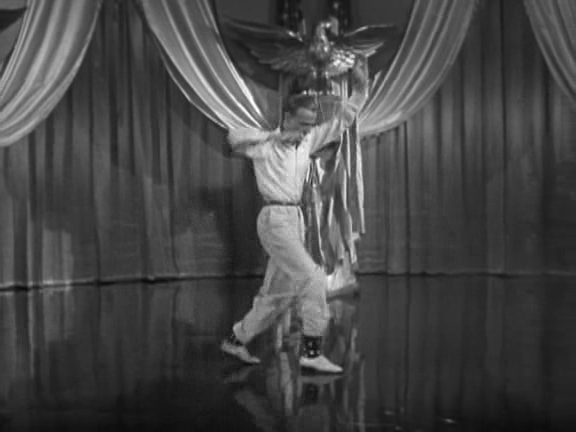 Tensions arise when his new dancing protegee and love interest (Marjorie Reynolds) strikes the fancy of Astaire, who tries to steal her for his own performing — and romantic — purposes. Peary notes that this holiday TV favorite, while “not a great musical”, is nonetheless “enjoyable and extremely popular”, and argues that while the “plot’s a bit foolish… Berlin’s score is lively and patriotic and Crosby’s crooning and Astaire’s dancing are super”. 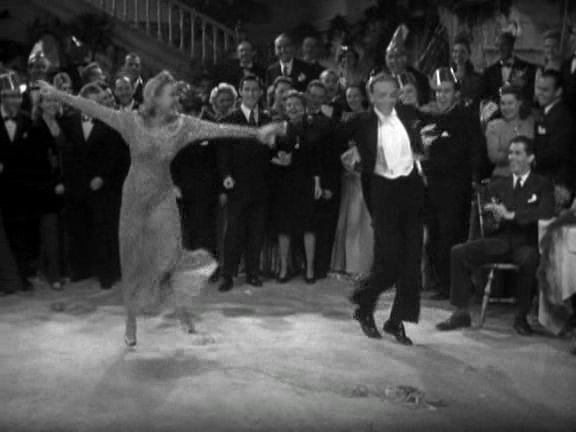 This just about wraps the film up in a nutshell: it’s worthy viewing for Astaire’s knock-out dance routines (his infamous shuffle with firecrackers is particularly stunning, as is his equally infamous “drunk dance”), and most film fanatics will probably be curious to see a movie with such enduring popularity. Yet it’s actually somewhat disturbing to watch Astaire being such a heel; while the entire plot hinges on this inevitability — and we highly suspect the “right man” will win the girl in the end — the ride until then is mildly discomfiting. Equally cringe-worthy is a minstrel number performed on — of all days — Abraham Lincoln’s birthday, in praise of good ol’ Abe, savior of the slaves; and the stereotypical mammy role played by Louise Beavers simply heightens how dated the film really is in some ways. But that Astaire sure can dance (Reynolds is quite good, too), and that Crosby sure can croon, and Berlin wrote a passel of fun tunes to celebrate the major American holidays — so enjoy these elements, and feel free to tune out the rest. Note: The hotel chain Holiday Inn was indeed named after this movie; see TCM’s article for more trivia. Yes, simply for its historical popularity — and to see the incomparable Fred Astaire at work. A must – for its place in cinema history, and, oh, that Fred!!! Peary is right; this isn’t among the great musicals. It’s got a paper-thin situation (as opposed to a plot), which is really just an excuse to string Berlin’s songs together. The screenplay isn’t all that cleverly written and is a little downright sloppy (one major character, after understandably disappearing early on, returns midway for about five minutes and then, without explanation, is nowhere in sight until much later suddenly in the finale!). Still, it’s not dull and, if you give yourself over to it, you should find it pleasantly diverting. ~which reminds me: Dale and Reynolds are two actresses not much known outside of this picture, though Reynolds went on to some notoriety on tv in ‘The Life of Riley’. It’s funny and, in a way, refreshing to see very unexpected female co-stars here. They both do rather well but it’s kind of like watching two talented understudies going on cause the name talents are sick. Re: the blackface…it is somewhat off-putting to see it in an old film now. But it’s interesting that the use of it here is offset not only by the delightful depiction of Beavers with her children but the New Year’s scene in which her children are dressed as Father Time and Baby New Year (both usually caucasian). Blackface was so widely used in theater for so long that its real effect was long in being realized. Its use here comes off at the very worst as naive.